Exercise is critical for improving one’s overall health. 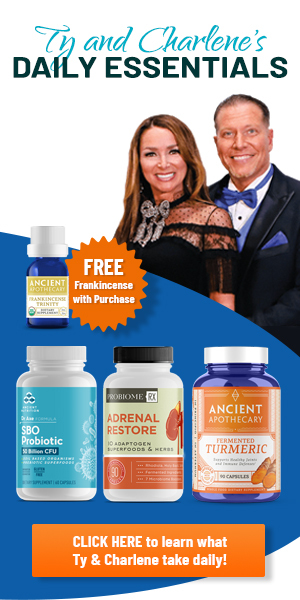 It is the key to cardiovascular wellness, respiratory productivity and improving your mood. 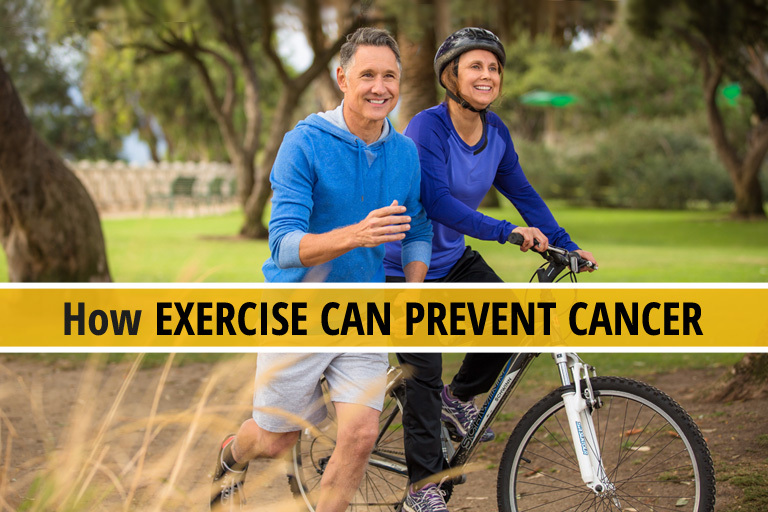 Many people don’t enjoy adding exercise to their daily life and yet, it’s been proven in thousands of studies to both prevent and fight disease. It is a complementary treatment without negative side effects! Don’t ignore the benefit of a 30-minute workout. Your health is worth the investment. A walk around the block, a yoga class, time on a stationary bike or treadmill (especially when the weather is bad) are excellent low-impact ways to get your blood pumping! Early in the morning is one of the best times to exercise. It revs up your circulation, warms the muscles, and clears the “fog” from your mind. Starting your day with a workout will keep you energized and alert. A pleasant-looking body can be achieved through exercise, but you can also enjoy other benefits. These benefits enable the body to fight serious illnesses that can easily destroy the body. Part of a healthy weight control plan. 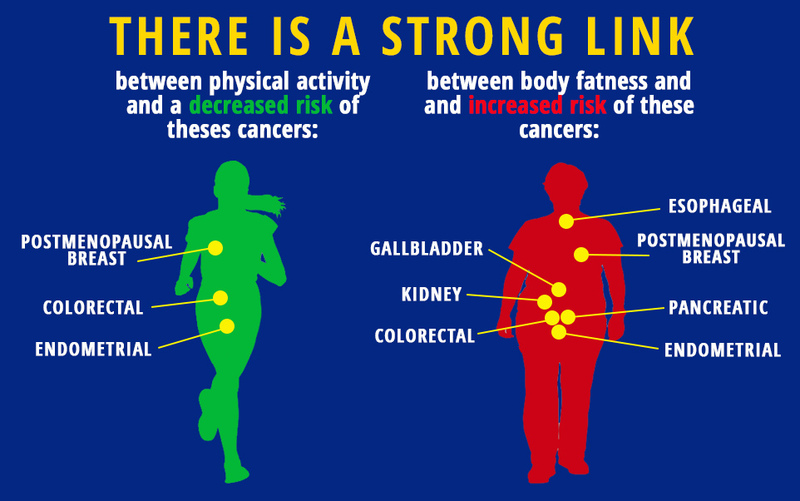 Obesity is a primary risk factor for cancer, metabolic syndrome, heart disease, diabetes, arthritis, and many other serious health conditions. Helps improve mood and prevent depression – a serious side effect of cancer diagnosis and cancer treatment. Exercise boosts the production of the endorphin hormones in the brain that make you feel happier and more relaxed. Improves energy levels by boosting your body’s circulation and delivery of oxygen to your cells. Over time, your heart, lungs, and muscles get stronger and work more proficiently. Get better (and deeper) sleep if you suffer from insomnia – a common complaint amongst patients struggling with the anxiety of their cancer crisis. Boosts the excretory system so that cancer-causing toxins and waste are removed more efficiently. The fewer the toxins in your system, the better you’ll feel overall. The excretory system is comprised of your blood, lymph, bladder, kidneys, and intestines. Enhances your immune system (specifically the lymphatic system) preventing the growth and spread of disease-causing organisms in your body. A strong immune system is your best defense against cancer. Makes you more conscious of your overall lifestyle choices. People who exercise regularly tend to be more attentive to their food choices and water intake. They are also more likely to eliminate pro-inflammatory substances such as dairy, processed foods and excessive alcohol consumption. You don’t have to spend all your time in the gym or invest a fortune on home exercise equipment. To improve your health from head to toe, you can incorporate “healthy movement” in many ways that won’t feel like a chore. Exercise shouldn’t be awful. It can help prevent cancer – as well as dozens of other serious, life threatening diseases – and keep it from coming back. Help your body get strong and stay strong with thirty minutes of heart-pumping, physical activity every day. Once you get in the habit of “moving,” you’ll never want to stop. The trick is to find the exercise or activity that’s right for you, something you love and get excited about doing. Editor’s Note: This article was originally published in February 2015. 5 Myths about Cancer Exposed! Love you Ty Bolinger! May God speed. I recommend those articles to everyone! Don’t stop, keep doing!and thank you! I was eight months in chemotherapy. What kept me sane were my weekly Yoga classes and Qi Gong exercises, almost daily. I also adopted three dogs from the shelter. They keep me going, meaning I have to go out for long walks ! You forgot one very important way of exercise. Dancing!!! For example joining a dance class is a great way of exercise. It`s for body, brain and mind and is much fun and makes happy. And, all the exercises can be enhanced by deep breathing. Many people do not empty the lungs fully, and do not inhale as deep as possible. Even walking can be enhanced dramatically with this awareness. All this is what I have done in the past but I still got breast cancer… I am now 87 and after having a stroke and heart failure I am wondering what kind of exercise would make any improvement… I eat sensibly, don’t smoke or drink alcohol or fizzy drinks… I live on my own so have to be able to look after myself…. Congratulations Mr Ty and Blessings upon you and your quest spreading the knowledge you have acquired and now share with hopefully the four corners of the globe. I live in Australia and have just listened to Episode 2. I am so blessed and grateful for the insight I had in 2015 not to have radiation following a lumpectomy of the breast. I have slowly and with limited resources ( mainly due to finances) been able to change my diet and life regime towards natural healing. I also believe in the properties that natural essential oils can heal. I am now more committed than ever to continue on the quest to learn more and also to share with others the truth on how we indivually can nurture and estimulate nature’ s ways, plus taking a complete turn around and allowing nutrition and exercise do its work and ts magic on healing the body of decease. Thank you again for sharing your passion and knowledge. Great info but I have a disadvantage since I live in Canada and a lot of the vitamin pills etc aren’t available to purchase. Try The Wolfe Clinic, originally established in Canada, was founded by Dr. Darrell L. Wolfe. With over 25 years of successful practice, experience, research and training in natural healthcare, Dr. Wolfe developed a “Self-Help” Strategy approach to healthcare maintenance and regeneration. I am the same as I live in Canada & will not give my bank card number out so sure wish I could buy your products in Calgary, Alberta. Would you consider a place in Calgary to be able to buy your products? Swimming is the best. I’m 63 and I do lots of resistance exercises in the pool as well. Best thing bout swimming its not hard on your joints. Take it up people it’s so relaxing as well.? Swimming is great as Bella said, but not if you’re swimming in chlorinated pools filled with chemicals that you inhale, ingest, and absorb through your skin. If you can swim in salt water pools, do that, it’s much better for you in the long run. I love biking, swimming and dancing. Dancing by far is my biggest joy. Find your joy. And then do it as much as possible! 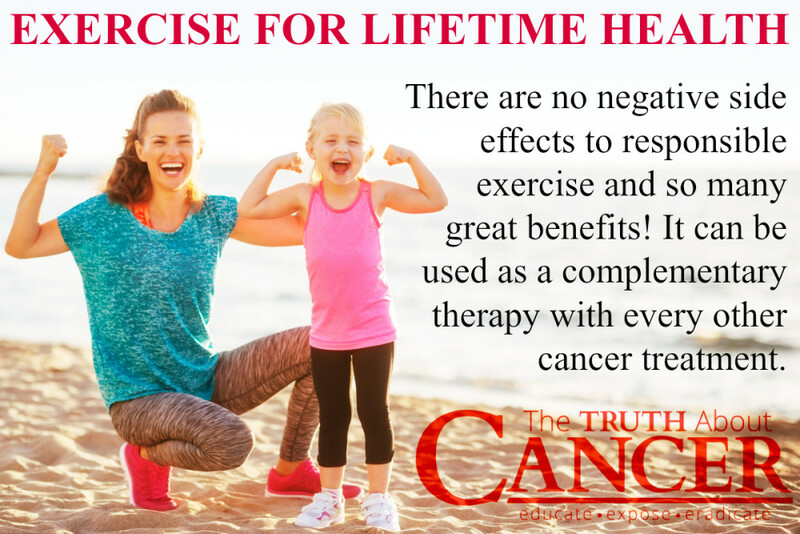 More will exercise if they know that cancer is killed by oxygen! Extra oxygen from exercise keeps cancer at bay. That’s why our grandparents lived to a ripe old age, they had to work to make a living. The best exercise I’ve learned to get the blood pumping is artifical cross country skiing. You don’t even have to lift a foot, turn on the music, stand bend those legs and move those arms like your cross country skiing and trying to push yourself through the snow with ski poles. Plus no jarring the knees! Works the largest muscles in the body, makes the sweat roll and easy! THANK YOU VERY MUCH TY, THIS INFORMATION IS VERY INTERESTING AND USEFUL FOR EVERYBODY.